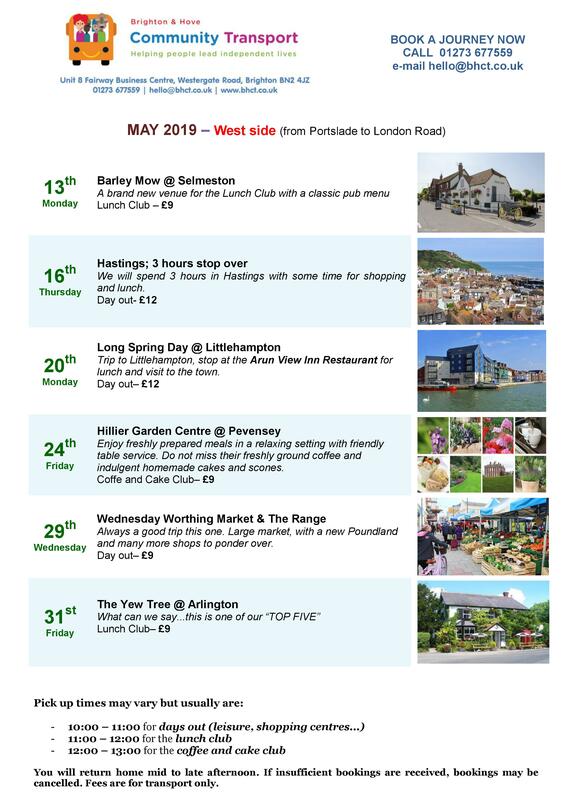 Our Shoppers’ Specials take us to different shopping destinations each month (usually outside Brighton and Hove) such as Tunbridge Wells, Horsham and Eastbourne, as well as garden centres. Recently, we also introduced special trips to leisure and cultural destinations in Sussex, such as the Bluebell Railway in Sheffield Park or the Tangmere Military Aviation Museum near Chichester. Transport service to a variety of different eateries in Sussex. 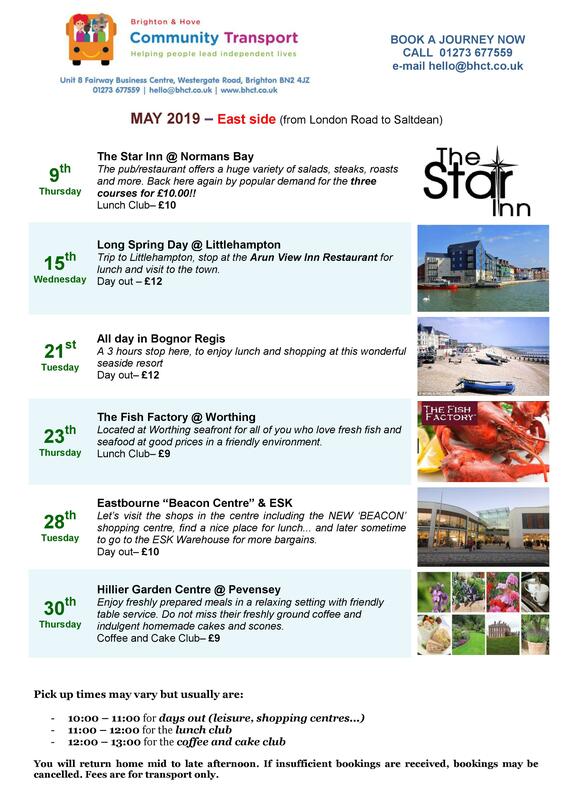 It is a chance to catch up with friends and make new ones over a reasonably priced meal, out and about in Sussex. Check the introduction page for this service and find out the next trip available. Some of you have said that you like our lunch club, but sometimes don’t always like to be out all day. For this reason we introduced – once a month from the East side and West side – an afternoon tea trip. Check the introduction page for this service and find out the next trip available. Transport service to the cinema: a great opportunity to see some of the latest cinema releases and theatre plays and maybe some old classics at wheelchair accessible cinemas and theatres in Brighton and East Sussex. Click here for more information. 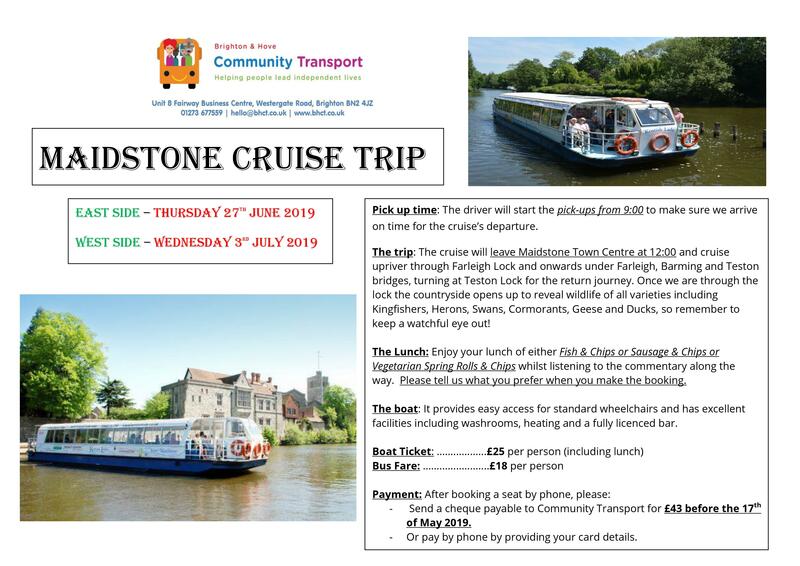 Community Transport sometimes organises one-off trips to events taking place across Sussex. Keep an eye on the site for announcements!